March 9, 2018 - by benign0 - 2 Comments. Sad that the UP Shopping Center (SC) burnt to the ground. The thing I really remember the most about the UPSC is that it was an old and rather stuffy place. I was only there when I had to have a haircut (almost always on a Sunday and, whenever possible, with the guy partially-disabled by polio who expertly buzzed my head while holding himself up with a crutch) and when I needed to have a report bound. I must have gone there for other reasons over the several years I spent as a student there but only the above two really stands out memory-wise. I was aware (mostly made aware) of Rodics, the “famous” food place there, but lunching on sinangag and fried egg sprinkled with salty beef particles for added flavour wasn’t my idea of a nutritious meal. I do recall that there was some kind of pet store (could have been just an aquarium shop) at the rear entrance facing the tennis courts and the dusty unpaved area that served as the SC parking lot. Hopefully that store was no longer there when this fire broke out as I can’t imagine how anybody could have evacuated all the livestock in that shop fast enough. Other than those fuzzy episodes, the UPSC wasn’t exactly a place one would hangout in in the sense of the shopping centres millennials would be hanging out in nowadays. For one thing, the UPSC wasn’t airconditioned nor was it a particularly well-lit place. Thankfully it had two entrances on opposite sides of its single main corridor that allowed breezes to flow through easily. It wasn’t tambay-friendly, in other words. 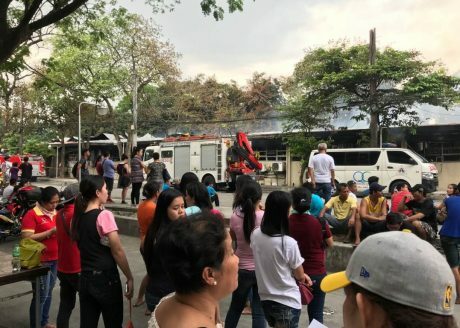 More importantly, it was a bit out of the way and not in the general route one would be taking walking between classes in the business, science and engineering buildings of the Diliman campus. I think it was because it was built primarily to serve the UP Village, the residential area where many UP faculty members lived. Though it’s a shame old buildings like these can’t be preserved, it’s a bit of a stretch to be nostalgic about what is really an unremarkable structure. Then again, buildings like the UPSC are what give the UP Diliman campus its distinctive character — a sprawling campus that had, in its early days, the benefit of lots of space on its side. Sadly, the ravages of Manila’s population density crunch are creeping into this fine campus which, as is becoming quite evident, going the way of the other tony campuses of the Philippines’ most prestigious institutions of higher learning. The Diliman campus had recently succumbed to population and vehicular traffic pressures surrounding it and had to secure its entry points thus no longer making it readily accessible to the public. What next after that? Walls, perhaps. Then privatisation. Familiar story, right? I never studied at University of the Philippines. so, I don’t know about the U.P. Shopping Center. If it is burned down; it can be built up by another new shopping center. Maybe , the communists in the U. P. , burned it down , as a symbol of crass capitalism. For in some ways the world was like a shopping centre, and he himself was a doubtful customer, often ineffectual, being talked into buying things he didn’t want, things indeed which nobody in their right mind would want to buy.